Published May 15, 2014 from Tilbury House Publishers. In today's world, more and more children have parents who live separately. As these children move between homes, they can't help but wonder: Will Mom still love me? Will dad? In this reassuring picture book, young readers see children who have two households whether because of divorce, separation, or other circumstances experiencing life's ups and downs with both parents secure in the knowledge that Mom will always be Mom, and Dad is forever Dad. I wrote this book so children will never doubt they are loved. 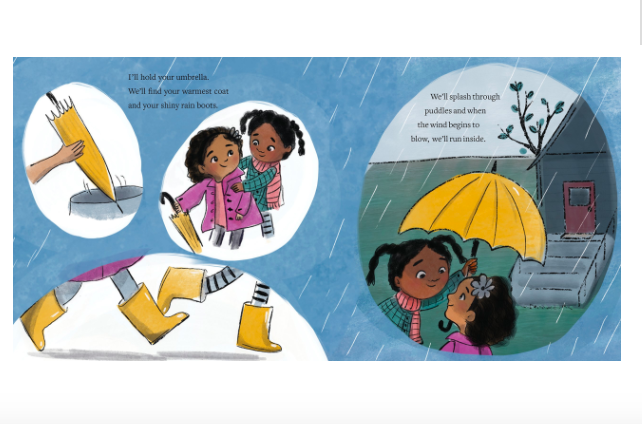 ​ With lyrical text and comforting illustrations, Stay Through the Storm is a deeply moving meditation on the power of friendship to carry us through difficult times. When dark clouds gather in the distance, two friends come together to comfort each other through the storm. They shield each other through the rain, make a fort inside, and play games between claps of thunder. Through it all, they come back to a consistent plea: Stay. Stay through the storm. A story to bring hope in times of trouble, Stay Through the Storm is a moving reminder that we're never alone even when things seem darkest.